B1628. HENRY C. LAHEE. The Grand Opera Singers of To-day. Boston, Page, 1912. 461pp. Index; Chapters & Photos incl. Garden, Morena, Caruso, Fremstad, Abott, Rappold, Farrar, Tetrazzini, de Cisneros, Bonci, Renaud, Gerville-Réache, Zenatello, Dufranne, Melis, Huberdeau, Destinn, Gay, Alten, Martin, Jörn, Amato, Gluck, Clément, de Pasquale, Slezak, Jadlowker, Whitehill, Mme Charles Cahier, Matzenauer, Griswold, Nielsen, Lipkowska, Dereyne, Jeska Swartz, Constantino, Mardones, Amsden, Scotney, Lankow, Vanni-Marcoux, Lucille Marcel, White, Teyte & Wittkowska. 461pp. Pages have gilt tops. 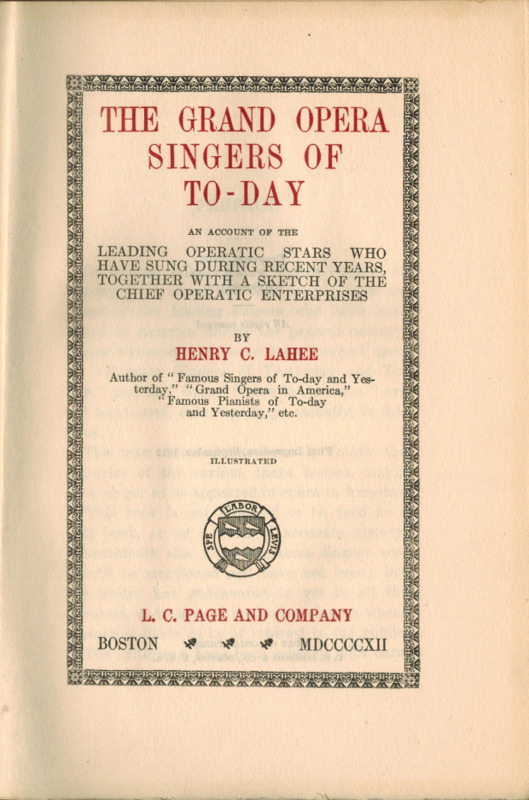 "In writing THE GRAND OPERA SINGERS OF TO-DAY the object was to give some account of the leading singers who have been heard in America during the present century. Contents Include; I. The Metropolitan Opera - House Under Maurice Grau. II. The Metropolitan Opera - House Under Heinrich Conried. III. The Manhattan Opera - House Under Oscar Hammerstein. IV. The Metropolitan Opera - House Under Gatti-Casazla and Dippel. V. The Boston Opera - House Under Henry Russell. VI. The Chicago - Philadelphia Company under Andreas Dippel. VII. Conclusion.... Many of the earliest books, particularly those dating back to the 1900s and before, are now extremely scarce and increasingly expensive." 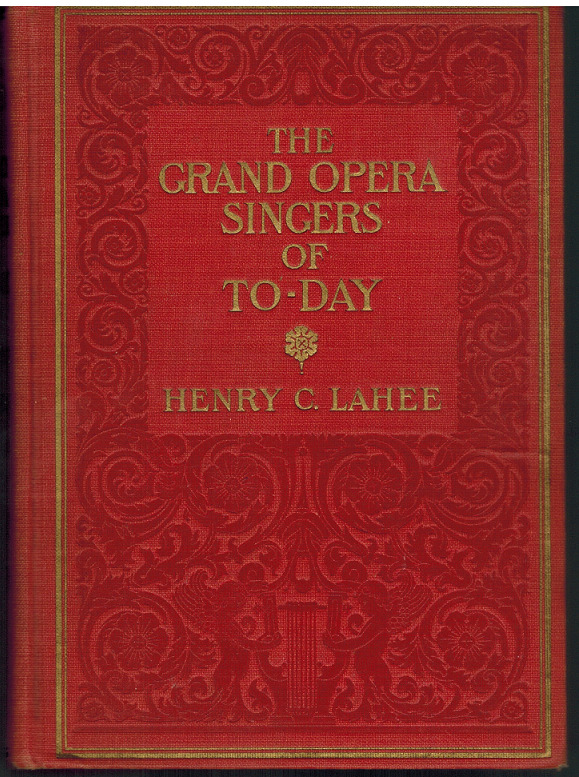 "Henry Charles Lahee (1856–1953) was an American author on music. He wrote several comprehensive biographical reference works on musicians."